Derrick Rose dropped 50 points on the Jazz on Wednesday night at the Target Center. They, in turn, dropped the finale of their road trip after winning the first three. It was decidedly not the way Utah wanted to finish its four-games-in-eight-days journey. Several players dressed quietly postgame, then slipped out of the locker room without uttering a word. Joe Ingles said he had nothing to say and stalked off. Still, at least a few were able to find some perspective after completing their first multi-game trip of the season 3-1. OK, so let’s start with the good, then. First off, the Jazz showed their offense can be a force. While the trip started off with a meager 100-point effort against the Rockets, that was followed with a season-high 132 vs. the Pelicans, then 113 against the Mavericks, and 125 vs. the T-wolves. Donovan Mitchell scored 20-plus points in each of the four games. Rudy Gobert finished the trip with three straight games of at least 20 points and 10 rebounds. Further, the supporting cast demonstrated it can be a significant component of the offense. Crowder and Dante Exum had 18 and 14 points, respectively, in Minnesota. Georges Niang and Grayson Allen had crucial stretches vs. Dallas with 13 and 11. Ricky Rubio, meanwhile, said the players’ familiarity with one another is a major strength. So, onto the bad, then. That one’s pretty simple, really — no one is happy with where the team’s defense is. After starting the trip strong by allowing just 89 points to the (admittedly short-handed) Rockets, the Jazz subsequently surrendered 111 to the Anthony Davis-less Pelicans, 104 to the Dirk Nowitzki-less Mavericks, and 128 to the (also short-handed) Wolves. There have been strong stretches, but entirely too many lulls. Perimeter defenders are getting hung up on screens and blown by far too often. And when Gobert is off the floor, opponents drive the lane with impunity. That was especially apparent vs. Minnesota when the center was whistled for a pair of dubious first-quarter fouls. 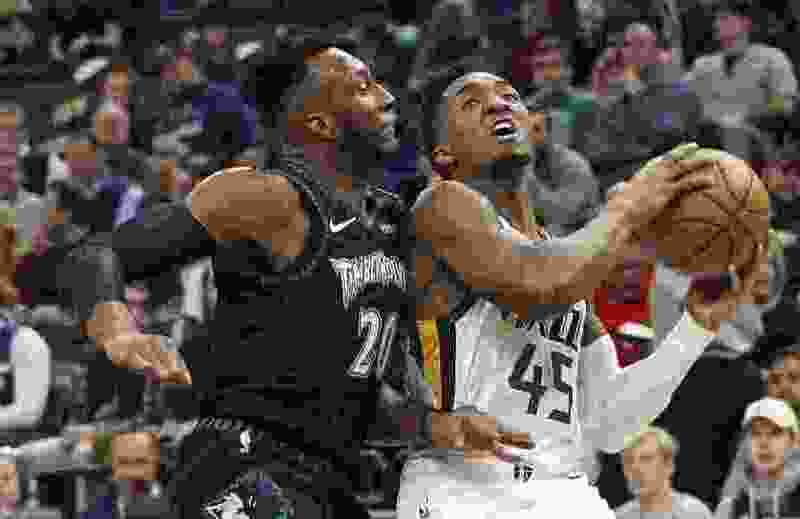 Gobert added that Utah has the potential to be a very good team, but that it must regain its defensive identity in order to do so. Yes, the trip concluded with disappointment. But the coach is hopeful that his team will be able to channel that into something productive. And even though he came out on the wrong end of the equation Wednesday, Rubio wouldn’t trade his new team for his old one. About the Grizzlies • Memphis is coming off a 107-95 victory over the Wizards on Tuesday. … Mike Conley had 23 points and seven rebounds, and Marc Gasol added 18 points and 13 rebounds in the win vs. Utah. … Conley is leading the team in scoring with 19.0 ppg, but is shooting just 38.1 percent from the field.